By popular demand, the Streak is back! We'll begin with a bang on New Year's Day (think there might be a little college football involved...?) - make sure to log in early to start your year off right. There's another million bucks (that's right, $1,000,000.00) for the Grand Prize winner and we'll continue to have monthly prizes as well. If your aim is off early on, don't despair - remember that Big Sam started off his Streak career with 5 consecutive losses, yet persevered to win his million! With only two days left, two users are tied for the longest historical streak (Grand Prize winner excluded) at 24 in a row. The first tie-breaker is overall winning percentage. Will this come down to the last matchup of the year? Our Pigskin Pick'em group winner is J.Gary also knows as "Sad Lions Fan." At least you won something, unlike your Lions! He finished with a total score of 138, three ahead of our second place finisher. Congratulations to t.rogers on his 2106 total points in The StreakMaster Gridiron Challenge group. As for The StreakMaster, he finished in the 82nd percentile. Not bad, but not good enough! Two afternoon matchups start our day, first with an English Premier League matchup between Aston Villa and Hull City. The road team is not only favored in the Vegas books but in Streakers' eyes as well. Our other matchup features Maryland against Nevada (-2) in the Humanitarian Bowl on ESPN. In NBA action, we have the Hawks at the Pacers (-1) and the Clippers at the Kings (-2). We also have a phenomenal player prop between superstars, LeBron James and Dwyane Wade. LBJ gets points + rebounds while D.Wade gets points + assists. Watch out for a 35-35 tally here. For College Basketball action, Illinois is at Purdue (-8) in their first Big Ten action of the year (Streaker trap?) Clemson (-3) at South Carolina and New Mexico is playing down the street at New Mexico State (-1.5). Pacific Life Holiday Bowl (San Diego, CA): Who will WIN the game? Oklahoma State versus Oregon should be one of the most entertaining bowl games of the year. One thing is for sure, there will be plenty of points on the scoreboard when this one is over. The Cowboys are favored by three against the Ducks, and The StreakMaster likes the favorites in this one as well, by six or seven points. Streakers finished the day with an overall winning percentage of 56.3 percent. The biggest winner was Rutgers who squeaked by NC State in the Papajohns.com bowl. The top streak breaker was the Connecticut Huskies who were run out of the building by the Georgetown Hoyas. The NFL season is over, so instead of "Monday Night Football," ESPN showcases two college bowl games. We've also put the English Championship League's top team on the slate, along with NHL, NBA, and a matchup of two top college basketball teams. First place Wolverhampton visits Blackpool in a 2:45 p.m. ET soccer matchup. It's the home team that gets the draw, which is enough to sway most of the early-picking Streakers. Streakers can watch live on ESPN360. The first bowl game begins soon after at 3 p.m. on ESPN. North Carolina State takes on Rutgers in the Papajohns.com bowl in Birmingham, Alabama. Rutgers is the Vegas favorite, while the Wolfpack come in on a four-game winning streak, all of which they needed to become bowl-eligible. In the best college hoops contest of the day, these two top Big East teams kick off conference play in Hartford at 7 p.m. on ESPN2. Both teams have had impressive early season runs, with the only blemish being Georgetown's late November defeat at the hands of the Tennessee Volunteers. At 8 p.m. on ESPN, the Alamo Bowl kicks off in (of course) San Antonio. Missouri is heavily favored over Northwestern, but many observers believe that Northwestern will have the motivational advantage. Streakers continued to be successful, winning almost 2/3 of their selections. Wigan Athletic and the San Diego Chargers led the way. Mavs hit final shot to determine Christmas Day Streak winner at 1:17 a.m.
With one matchup left, there were two possible winners. Jason Kidd scored the final point of the game on a free throw to make user fennemike our unofficial winner pending verification of picks and eligibility. Streakers also set a record for the most selections made in a single day, and finished with a 46% winning percentage. Thanks to everyone who participated in our Christmas Day basketball extravaganza! We're back to business as usual tomorrow. Home Stretch update at 11:52 p.m.
Antawn won the battle 4-3, but Mo won the war as the Cavs came back in exciting fashion to defeat the Wizards. The venue is now Portland, where the Mavs and the Trail Blazers conclude a very full day of NBA action. Portland won the race to 10 with little trouble before Dallas started to fight back, and eventually take the lead. The second quarter matchup between Nowitzki and Roy looked like it could go either way, and ended up producing the highest-scoring player contest of the day as Dirk came out on top, 10-7. With two matchups left to be determined, the Christmas Day Leaderboard has two clear front-runners. It could all come down to the final basket of the day - literally! Wizards, Butler score Streak upsets at 9:17 p.m.
Washington was ready to play right out of the gate, and it showed as they quickly ran out to a 12-2 lead, dashing the hopes of more than 90% of the Streakers with perfect records up to that point. Then, Caron Butler's two second-quarter points was enough to tie an unusually quiet LeBron James - that did in the four remaining 10-0 Streakers. However, there's still plenty on the line, and the top of the leaderboard is tight. Next up is the third-quarter matchup between Antawn Jamison and Mo Williams. Antawn shook off an early finger injury to score 17 first-half points, leading all players. Will he maintain the hot hand, or will Streakers look elsewhere for Mo money? Kobe outscores Pierce; Pau thins leaderboard at 7:17 p.m. The Celtics-Lakers game has lived up to its billing, as every time Los Angeles threatens to go ahead by more than a few points, Boston responds. The Lakers lead by four after three quarters. Most Streakers were pleased when Kobe outscored Paul Pierce 6-2 in the second quarter, and the leaderboard was packed with perfect 8-0 records for the day. Alas (for the majority), in an exciting battle, Gasol edged out Kevin Garnett in Q3, with the winning margin a single free throw capping a rare two-player three-point play. The Streak now rests until the Cavs and Wizards tip off in a matchup that so far has Streakers picking Cleveland by an overwhelming 99-1 margin. Parker beats Nash and Spurs win thriller; Lakers first to 10 in battle with Boston at 5:33 p.m. The Q3 matchup between Tony Parker and Steve Nash was in doubt until the last few minutes, when Parker decided to force the action from his PG position. The result made Streakers happy, as they sided with the Spurs playmaker by a 4-1 margin. Attention then shifted to the Celtics-Lakers matchup, where Streakers split down the middle trying to decide which team would make double-digits first. The Lakers made it on a flying Bynum dunk. Suns start out hot; Duncan keeps the game close in Q2 at 3:44 p.m. The race to ten was never in doubt as Phoenix scored the first 11 points of the game. The Spurs battled back, and have kept the game close since then, trailing by six at halftime. In the Streak's second quarter matchup, Tim Duncan scored five points with a couple buckets in the key and a free throw, and that was enough as Stoudemire sat out much of the second frame and ended up with only one made jumper. Looking ahead, Streakers are going strongly with Tony Parker over Steve Nash in the third quarter. Hornets mount comeback in third quarter at 2:03 p.m.
New Orleans easily wins our Q3 prop as they start to find the range from long distance. Orlando still carries a 19-point lead into the fourth quarter. The Streak, meanwhile, takes a short break until the Spurs and Suns tip off in approximately 40 minutes. Orlando first to 10, Howard wins second quarter at 1:15 p.m.
Orlando came out with a vengeance, and now has a 30 point lead at halftime! The second quarter matchup between Chris Paul and Dwight Howard was closer, as both players started on the bench. Neither one had scored until Superman slammed one home with 3:47 left in the period. He followed that up with two more quick buckets, and while CP3 had a couple late baskets of his own, it wasn't enough as Howard won the quarter six points to four. Merry Christmas and Happy Holidays! Welcome to our NBA Christmas Day Streak Contest! As you can see there are 16 matchups on the board today and if you win all 16, you win $100,000 and a trip to this years NBA All-Star Game. Each matchup will have its time-slot adjusted if necessary for Streakers to pick every matchup on the board. If nobody can guess all 16 correctly, the longest streak of the day will receive $10,000 and the trip to Phoenix for the NBA All-Star Game as well. Good luck to all! The StreakMaster's best bets: Hornets first 10, Howard 2nd Q pts, Hornets 3rd Q pts, Spurs first 10, Amare 2nd Q pts, Parker 3rd Q pts, Celtics first 10, Pierce 2nd Q pts, Garnett 3rd Q pts, Cavs first 10, LBJ 2nd Q pts, Mo Williams 3rd Q pts, Portland first 10, Roy 2nd Q pts, Aldridge 3rd Q pts, and Dallas final point of the game (in a loss). Wow, was Notre Dame impressive or what? Sure, they didn't beat Penn State or USC tonight but they looked great in Hawaii. That being said, Streakers overall went against the Irish, and that is the reason why yesterday's overall winning percentage was only 37 percent. "Let's hear it for ol' Notre Dame..." Too soon? It seems as though all the major sports are taking today off, but not us here at Streak Headquarters! Early in the a.m. the ASEAN Championship takes place in Bangkok, Thailand which gives the Thailand team the big advantage. Luckily for Streakers (well not really), on our board the game will be an "total goals" over/under matchup with the line at 2.5 goals. Two props surround the Hawaii Bowl at 8:00 p.m. ET on ESPN. Both quarterbacks battle it out in a "more passing yards" matchup. Notre Dame's Jimmy Clausen has been inconsistent all year but he does have the talent to have a huge game, while Greg Alexander of Hawaii is coming into the game on a hot streak, throwing for over 260 yards in his past four games. Our second prop is more of a "toss-up" that will award a victory to the team with the longest touchdown. Will the Fighting Irish be focused enough to take down Hawaii on their home turf? The StreakMaster barely thinks so as he picked Notre Dame in the Bowl Mania challenge but with only one confidence point. Charlie Weis' team is favored by two, but nobody would be surprised if they lost by ten here. Butler comes through for The StreakMaster! It is pretty safe to say that Xavier was the day's streak breaker with 98.7 percent of Streakers taking the Mountaineers in that matchup. Streakers ended the day with a 39.8 overall winning percentage as well. Bowl season is upon us! Saturday's card includes three bowl games that you can view on ESPN. There's also a wide array of NBA, NHL, college hoops, and morning soccer. With fifteen matchups in total, every Streaker should find something to his liking. We're back to England in the early morning, this time for an ESPN360 matchup between Birmingham City and Reading FC. With the host team a sizable favorite, we're giving Reading the draw as well. You'll want to get your pick in early for this one - it begins at 7:45 AM. At 11 am, Wake Forest meets Navy in the inaugural EagleBank Bowl. The game is at RFK Stadium, so we're figuring that the crowd will be behind the Midshipmen. On the other hand, Navy's rushing attack is not suited for big comebacks, so if the Deacon Demons get an early lead, Navy will be in trouble. The middle of the day is a basketball fan's dream come true as three different college games match ranked teams. First, Xavier meets Duke at the Izod Center in East Rutherford, NJ. This game will match Duke's high-scoring offense against a stifling Xavier defense. Later, UConn travels to Seattle to take on Gonzaga in what yours truly expects to be the most exciting game of the day. Will Josh Heytvelt take his game outside to avoid the imposing Hasheem Thabeet? The trifecta finishes with Syracuse visiting Memphis State in an ESPN broadcast. The #8 Orange may be without their leading scorer, so you'll want to check the latest information before making a selection here. The Cougars are gunning for their fourth straight Las Vegas Bowl victory, while the Wildcats are playing their first post-season game in a decade. The early returns show Streakers preferring BYU by an over 20-1 margin! This stands in stark contrast to the Vegas line, which makes the Wildcats about a field goal favorite. Lines aside, this will be settled on the field starting at 8 PM. ESPN carries the broadcast. Streakers are officially in a slump. Another bright morning (Hartlepool's easy win over Southend) quickly dissolved in a morass of Bucks, Spiders, and Heat. By the time the day was done, Streakers were once again under 45%. Yesterday's proposition matchup between Terrence Williams and Chris Warren has been rescored. Upon further review of the official box score, both players were credited with four assists. Streakers who made a selection in that matchup have been updated accordingly. It's another NBA-fest, with multiple props on both ESPN games. Some savvy Streakers should submit seven separate selections! Alliteration aside, the action will be fast and furious from the opening tip of the Lakers-Heat game to the final point of the Cavs-Nuggets contest. Before the hoops begin, we're offering an English League One match. Hartlepool hosts Southend; so far, Streakers are siding with the home squad by a 9-1 ratio. At 8 PM, there's college football on ESPN2. Montana takes on Richmond in Chattanooga, Tennessee for the FCS (Football Championship Subdivision) title. The Grizzlies are gunning for their fifth title of the last two decades, but the crowd is likely to be behind the surprising Spiders. There's also a hockey game on tap: Edmonton hosts Anaheim at 9 PM. While the Ducks have the better overall record, they have yet to win a road game in December. Throughout the evening, there are three props available on the Lakers-Heat game. Streakers feel strongly that Los Angeles will be the first team to reach double-digits. You can also predict whether Kobe or Wade will have the more prolific second quarter, and whether the two teams will be hitting from long range in the third quarter. King James visits Melo and the gang in a game scheduled to begin at 10:30 PM. Streak action will continue late into the night, with props available in every quarter of the game. For those who prefer a more sedate pace, you can also play the entire game straight up. Good luck! Streakers suffered through another subpar day, with Manchester City the biggest disappointment as they were shellacked by Racing Santandar in UEFA Cup action. Will Streakers recover today? So you didn't win a million dollars in 2008 (unless your Bigsam), so why not start off the year right with a prize from The StreakMaster? As most of you may know, ESPN's College Bowl Mania starts up Saturday morning with the EagleBank Bowl between Wake Forest and Navy at 11:00 a.m. on ESPN. The StreakMaster's desk is full of team schedules/results for research, so much so that he can't find his yogurt (with granola!) His picks will be in by tomorrow, so there's still more time to get some Streakers in the Beat The StreakMaster group! More UEFA Cup matches start off today's board with a very even Udinese vs. NEC Nijmegen matchup with the road team receiving the draw. Also, another Streaker favorite, Manchester City gets the draw on the road at Racing Santander. Three NHL games make it to the board again, with the Canadiens, Lightning and Coyotes favored. There are Several player props in NCAA basketball action, first with a "higher total" matchup with Mississippi State's Jarvis Varnado and his points plus assists vs. Cincinnati's Deonta Vaughn and his points plus blocks. Also, UNC's Tyler Hansbrough takes up an entire matchup with an over/under on his points plus rebounds with the line at 35.5. In NBA action, the Spurs are at the Magic (-3.5) and Amare Stoudemire takes on Brandon Roy in a "more points" matchup. NCAA basketball (Mississippi at Louisville): Which PLAYER will have "more assists"? Chris Warren and Terrence Williams lead their respective teams in assists, above four per game, so The StreakMaster decided to try this kind of prop. Louisville should win this game easily and Williams should have the edge. What a fun night that was! Streakers overall didn't do too hot, finishing with a 30.2 overall winning percentage. The top streak breaker was the always popular AC Milan, who tied VFL Wolfsburg, 2-2. Welcome to our "NBA Extravaganza!" For both our NBA games on ESPN, we have added five props for each. Every matchup in these two games will be available for Streakers because The StreakMaster will adjust the starting times for each prop as the games go on. With 10 possible wins for these two NBA games, paired with two different soccer time slots, it could be a 12-win day! Our first soccer match at 11 a.m. ET, with a round of 16 Coppa Italia "total goals" matchup featuring Fiorentina and Torino. Oddsmakers have the line listed at 2.5 goals but doesn't it seem like most of these matchups go "over"? In the afternoon we have two UEFA Cup matches with both home teams favored. One of the Streakers' favorite teams, AC Milan headlines the board favored over VFL Wolfsburg. NHL favorites for the night: Sabres, Wild and Rangers. NBA (Boston at Atlanta): Which team will make the "first 3-pointer in the first quarter?" Streak for the Cash and the NBA is where "Wow, I just won ten matchups in a row" happens. Most of our matchups for both NBA games are toss ups but there is a chance someone will win all 10. The StreakMaster's advice: Do your research, and hope you get lucky! Best Bets: Hawks more 3's, 2-pointers, Celtics more 2nd quarter points, Joe Johnson, Al Horford, Spurs first free throw, Hornets score last, Parker more second quarter points, Ginobili fewer fouls and Spurs last rebound. Good luck! Streakers fell below .500 again, finishing the night off with a 49.7 overall winning percentage. The Chicago Bulls were the day's top streak breaker while, Kobe Bryant was the top extender. Get ready for a lot of movement on the leaderboards after tonight. A new kind of prop hits our board tonight for "Monday Night Football." Donovan McNabb is leading the surging Eagles into playoff contention and with another solid performance, they will be in a decent spot for an NFC wild-card birth. Even though many predict McNabb will have a big game, he has been sloppy at times, throwing ten interceptions this season. "Accuscore" predicts an interception, but against a depleted Browns team The StreakMaster thinks there is a 50-50 chance. Don't forget about Beat The StreakMaster Bowl Mania group. Only five days left to get your picks in! After two monster cards over the weekend, the Streak quiets down today as most major sports run a reduced schedule. While the highlight MNF game appears to be a blowout, longtime Streakers are well aware that Cleveland is capable of pulling a big upset in prime time. For those who prefer hoops, we've got some interesting player props on the board, as well as a couple straight-up matchups. Once again we begin our day overseas. Derby County visits Charlton Athletic in a match you can watch live on ESPN360. Charlton is a heavy favorite, but Derby needs only a draw the way the Streak plays it. Has there been a bigger breakout player this season than the Nets' Devin Harris? He's averaging over 24 points per game, good for sixth-best in the NBA. He faces the man in fifth place tonight as New Jersey visits Chris Bosh and the Raptors, so we've matched them up on our board. A half hour later, the Jazz visit the Celtics, who have forgotten how to lose. We think too much of Boston to offer the game straight-up, so we've pitted Kevin Garnett's rebound total against Deron Williams' assist count. Deron has four straight games with double-digit dishes. Here are two teams moving in opposite directions. The Browns are down to their third-string QB, while the Eagles have righted the ship after some early-season woes. Brian Westbrook is en fuego with five TDs in the last two games, while the Cleveland offense hasn't scored a TD since November 17th. Will the teams combine for 40 points? It could be awfully chilly in Philly. If neither side appeals, we've also offered a proposition on whether McNabb will throw an interception during the game. The Streak's night finishes with a Beno Udrih sighting. Beno takes on Al Jefferson, but while Beno gets to count points, rebounds, and assists, Al gets his points only. We thought that would make it fair - do you? Streakers had a rough day, getting less than 40% of their picks correct. The Giants, the Pack, and Len Mattiace led the way, so to speak, as all three heavy favorites went down to defeat. The day would have been even worse had not Big Ben led Pittsburgh to a fourth-quarter comeback win over the Ravens. Golf, soccer, football, basketball, hockey - the usual mishmash. Or would that be a hodgepodge? Is there a difference? Either way, it's still Sunday, and so the NFL gets the lion's share (though hopefully not the Lion's share) of the attention - however, with 15 different matchups listed, every Streaker should find a matchup to his liking. It's the final round at South Africa's Alfred Dunhill Championship, and Len Mattiace looks to bring three straight Wins home for faithful Streakers. This time he's teeing it off against South African Thomas Aiken, who leap-frogged into the lead with yesterday's 61, a course record. The duo is scheduled to begin at 5:05 AM Eastern time. And no, any potential playoff holes will not count towards the final round score. The Streak then moves north from Mpumalanga to the Eternal City, where streaking AS Roma hosts Cagliari in a total-goals matchup. Both clubs have 20 points in Serie A play. Crossing the ocean to North America, the Streak makes a quick stop in Canada. We pit the New Orleans Hornets against the Toronto Raptors in a "Which team will score first?" proposition - expect this 12:30 PM matchup to be settled before the early NFL games begin. There's a wide array of NFL action on the board - choose carefully. There are even a couple player vs. player matchups to add a little spice. For those who like to revel in the misery of others, we've included the Seahawks-Rams tilt. If you'd rather watch a higher level of play, the Falcons host Tampa Bay in a game with major playoff implications. Oh c'mon, I don't need to explain this one. Giants. Cowboys. Primetime. This game could well depend more on who doesn't play than on who does play. The Cowboys are looking for revenge after getting blown out in Week 9, but that was with Brad Johnson taking the snaps. The Streak ends Sunday back up in Canada, when we offer a rare total-goals NHL matchup. Florida travels 3000 miles from home to take on Vancouver - will the two teams combine for at least six goals? Buoyed by Mattiace (again), and Xavier's easy victory, Streakers won over 60% of their selections. The most exciting matchup of the day was our college basketball scoring prop between Sherron Collins of Kansas and Ricky Harris of UMass. Harris led most of the game, but Sherron hit a couple buckets in the waning seconds to win their head-to-head contest. Despite that, UMass won the war, with a 1-point upset victory over the heavily-favored #23 Jayhawks. There's a potential for four wins on the Friday board for attentive Streakers. The matchups include early golf, soccer, and both NBA and NHL. It's back to South Africa for another round of the Dunhill Championship. This time we're matching first round co-leader Len Mattiace against Darren Fichardt. Can the American repeat yesterday's success? Early-picking Streakers believe so, as Mattiace is currently favored by an amazing 98 percent. The duo tees off early, so get your pick in by 5:20 ET. We're offering a new kind of prop in our Dutch Eredivisie soccer matchup between NAC Breda and Ajax. Instead of a side or a total, Streakers can predict when the first goal will be scored. Will either side find the net by the 21-minute mark? You make the call. The division-leading Hornets travel to Boston to take on the defending NBA champions. Watch this 5 PM broadcast on ESPN and root your team home. The game itself is not on our board, but we've matched stars Chris Paul and Paul Pierce against each other in a points-only contest. Who will win? Well, we're sure it'll be "Paul." Still up late on Friday night? Just keep the TV set to ESPN, and watch the Golden State Warriors host the Houston Rockets. For this game, our prop matches Rafer Alston's point total vs. Andris Biedrins' rebound total. Biedrins has ripped down 35 boards over the Warriors' modest two-game winning streak, but so far skeptical Streakers prefer the Rockets guard by a more than 10-1 ratio. Streakers started out hot, riding Rory Sabbatini to a 2-stroke victory over Simon Dyson. After that they cooled off, losing most of the day's remaining matchups. In the exciting Progressive Matchup of the Day, it looked like Drew Brees had no chance to reach 285 yards until the Bears sent the contest to overtime with a field goal on the last play of regulation. However, the hopes of the Brees-backers were dashed as Drew never even touched the pigskin in the extra frame. He could only watch from the sideline as the Bears received the kickoff in overtime, marched down the field, and kicked a second field goal to send the Soldier Field fans home happy. The eagerly awaited clash between Vale of Leithen and Inverurie Locos will not take place this afternoon because of a "frozen pitch." Thanks for the help, Simon. The StreakMaster has been getting some grief over his past few picks, but the truth is, he has been picking against the crowd lately. Guess it has not been working according to plan, whoops. 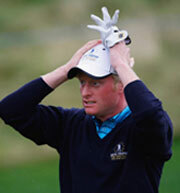 As for the Golf matchup today, Simon Dyson couldn't beat Rory Sabbatini! Why, Simon, why? The scoring was a little messed up this morning due to the tournament website incorrect leaderboard, but thank you all for being patient until it was fixed. It's another five-sport day at Streak Headquarters, with competitions from three different continents. We have a wide array of matchups to choose from, including an unusual Thursday Night Football offering. The morning kicks off with an early-bird (or should that be night owl?) golf special, as Rory Sabbatini is matched up against Simon Dyson in the Alfred Dunhill Championship. The early returns show Streakers favoring Sabbatini, who may have the home-field advantage playing in his native South Africa. Get your picks in early - this matchup locks at 5 AM Eastern! At a more decent hour, there's a total-goals offering for the third-round Scottish Cup match between Inverurie Locos and Vale of Leithen. In this match, any extra-time goals will count towards the total. NFL - Drew Brees passing yards total? The Saints visit Chicago for Thursday Night Football, and Brees will be in the limelight. Will the Saints' passing attack stay on record pace against the Bears defense? Brees has averaged over 300 yards-per-game - but don't forget that this game is in a December chill, at Soldier Field. In our late game, two of the best young teams in the Western Conference face each other as Brandon Roy and the Portland Trail Blazers visit Salt Lake City to take on Deron Williams and the Jazz. Carlos Boozer is expected to miss the game, but Paul Millsap is a more than adequate replacement. Expect this game to go down to the wire. Led by a Real Madrid romp, Streakers cruised to their fourth straight winning day. It would have been even better had not Andre Iguodala bested LeBron James in an exciting NBA prop offering - while King James outscored Andre 29-27, the Sixer's nine rebounds more than made up the difference. Since we are celebrating fantasy game champions over here in Bristol, The StreakMaster wanted to announce the winner of the "Beat The StreakMaster" College Pick'em group winner. Congratulations to bowie841733601 who had 551 points. As for The StreakMaster he finished in 19th place with 531 points, not bad. No prize for this group though, just bragging rights! For those who do not know, ESPN has released the new fantasy game, College Bowl Mania. If you want to make things more interesting for yourself, join the Beat The StreakMaster group. The winner may even receive a prize from The StreakMaster himself! Starting at 2:45 p.m. ET are a few UEFA Champions League matchups. CFR Cluj-Napoca and Chelsea battle it out in a "total goals" matchup with the over/under at 3.5 goals for the first time in streak history. Also, Bordeaux is the slight underdog on the road at AS Roma. A couple 7:00 p.m. ET college basketball matchups with #24 Davidson (-2) versus West Virginia at the Jimmy V Classic and Virginia Tech (-4) on the road at Georgia. For professional sports, the Canucks are on the road at the Predators (-115) in the NHL. As for the NBA, the Spurs are at the Mavericks, while the Blazers (-5) host the Magic. A couple of top teams in the College ranks hit the stage in NYC for the Jimmy V Classic on ESPN at 9:00 p.m. ET. Texas is a favored by four points but they seem to get distracted in New York City, sporting a 3-4 overall record there. That being said, The StreakMaster likes the Wildcats in this one. Yesterday's Results Streakers had one heck of a day, finishing with a 76.8 overall winning percentage. The top streak extenders were the Orlando Magic and the Carolina Panthers, while there were no major streak breakers. "Bigsam" made it 26 in a row with the Magic win as well. First purchase of "Bigsam's" million dollars should be a Romo jersey, thanking him for all his help. We now know the name of our grand-prize winner! Samuel Louis Charles of North Miami Beach, Florida, reached 25 wins in a row last night after the Steelers came back to defeat the Dallas Cowboys, 20-13. Pending prize eligibility, Charles will be on his way to ESPN Studios in Bristol, CT! Although, the million dollars has been won, there is still a $10,000 prize out there for the longest historical streak, which "Bigsam" will not be eligible for, so everyone has a chance! The English Premier League kicks the day off with a "winner" battle between Tottenham and West Ham United. The odds are dead even but with West Ham at home, The StreakMaster gives them the edge. In NBA action, a "higher total" prop starts things off with Emeka Okafor's rebounds against the Miami Heat's winning margin. The Heat are favored by 7.5, while Okafor averages 10.6 rebounds a game. Our "straight up" matchup features the Magic (-4.5) at the Clippers. Our NHL matchup features the Nashville Predators (-115) at the St. Louis Blues. "Monday Night Football" (Tampa Bay at Carolina): Which running back will have "more yards total?" Two very talented running backs face off in "more total yards" battle with both backs projected to go for at least 110 yards. The StreakMaster believes DeAngelo Williams will get more touches, which in turn means a higher total in his eyes. Don't forget the MNF game is a "straight up" matchup as well with the Panthers favored by three. If you have not checked the board lately, Bigsam1122 reached 25 wins in a row! As for the rest of you Streakers, there is still a chance for a longest historical streak as well as the December wins per month title. We have a full slate of matchups Saturday, starting with a Premier League total in the morning and ending with a prop on the De La Hoya-Pacquiao welterweight fight. In between there's plenty of college football. The Pitt Panthers look to justify their top-25 ranking when they play at UConn. ESPN carries the action at noon Eastern time. An hour later, Boston College plays Virginia Tech for the ACC Championship in Tampa Florida. That game is on ABC. Both of these games are offered straight up in the Streak. At 4:00 PM, in the most anticipated matchup of the day, #1 Alabama faces #2 Florida for the SEC Championship at the Georgia Dome in Atlanta. Streakers have a "total points" matchup in both this game and the USC-UCLA game that kicks off 30 minutes later on ABC. Both these teams play at 8:00 PM, but not against each other! Streakers get their chance to predict whether Missouri's high-powered offense will find more success against Oklahoma's dominating defense, or the Wildcats will pour on the points against a disappointing Arizona State team. Saturday night owls get one last chance to extend their Streak by deciding whether the De La Hoya-Pacquiao bout will go the distance. Little movement in the leaderboard, as it seems everyone is waiting for the top dog to make a play. Overall, Streakers had a good day, with more than 55% of all picks coming up roses. Due to rain, round two of the Nedbank Challenge has been postponed therefore our matchup is ruled a "push" and Streakers picks are now unlocked. After our Nedbank Challenge golf matchup early in the morning, the Austrian Bundesliga kicks off at 1:30 p.m. ET. Sturn Graz is slightly favored to win on the road even with the draw included. In the NBA, two struggling teams try to get a win when the Clippers take on the Grizzlies (-1). The MAC championship will be televised live on ESPN2 at 8:05 p.m. ET, where Ball State looks to finish the regular season undefeated. Ball State is heavily favored over Buffalo, so The StreakMaster put up a "total points" prop with the over/under set at 62.5. The Kings (-117) also host the Oilers in NHL action later on tonight at 10:30 p.m. ET. NBA (Portland at Boston): Who will score "more points" in the game? NBA player props have returned to the board! The Blazers are in Boston to take on the surging Celtics. Brandon Roy is predicted to score around 17 points tonight while Pierce is projected to have 18. It is safe to say this matchup will be a tossup. Going on a hunch, The StreakMaster likes Roy here. Streakers bounced back nicely, finishing the day off with a 76.9 overall winning percentage. There were no major streak breakers, but the leaderboard did not capitalize as the top Streakers had no movement. With less than a month left, Streakers at 15, 16, and 17 better start taking some chances! The StreakMaster has been noticing message board threads about the scoring of today's soccer match between AC Milan and Lazio. If the score is tied and goes into overtime, and a team scores, that goal will count towards our scoring. But, if it is tied, let's say 1-1 and then goes into penalty kicks, the score will be 2 goals and fewer. We hope that will eliminate any confusion, but The StreakMaster is still sticking by his 2 goals and fewer selection. Starting our day off on ESPN360 is a "total goals" matchup in the Coppa Italia between AC Milan and Lazio. AC Milan are the heavy favorites but with the over/under line at 2.5, the matchup could swing either way. Our NHL matchup features two surging teams in the Eastern Conference. The New York Rangers (-115) host the Pittsburgh Penguins, with the Rangers winning seven out of the last eight meetings against the Penguins in New York. The Bulls travel to Milwaukee to take on the favored Bucks (-3.5). The Bulls lost in an overtime thriller last night to the 76ers but with a 6-3 record following a loss, look for Chicago to bounce back nicely. Streakers had another rough day, finishing with a 25.8 overall winning percentage. The top streak breaker was the "under" in the Lakers-Pacers game and luckily The StreakMaster changed his mind at the last minute to get his first win this month. "Bigsam" is still at 24 wins in a row! Not only is The StreakMaster an odds genius, but a College Football genius as well. Think you know college football better than The StreakMaster? Test your skills in ESPN's fantasy game, College Bowl Mania. The StreakMaster has created his own group, for Streakers that want to challenge him. The winner will get a signed ESPN workout shirt from The StreakMaster himself! Welcome to "Prop Day" here at Streak Headquarters. Our matchup centers around the quarterfinals of the English Carling Cup with two heavy favorites battling it out in a "more goals" prop. Arsenal will be the Streakers favorite to win this prop but The StreakMaster will take Stoke City. Our first "total goals" prop for the NHL puts Lightning-Flyers game on the board with the over/under set 5.5 goals. The StreakMaster sees this one ending in a 3-2 Flyers win. NBA (Los Angeles Lakers at Indiana Pacers): How many "points will be scored" in the game? 211.5 seems like a lot of points for a game like this when the Lakers and Pacers are averaging 208 total pointsl on the season. The Lakers will most likely win this one but The StreakMaster is leaning towards a score of 105-94, which leads him to take the under. Yesterday's Results The overall winning percentage was was a sub-par 34.6 percent. Both streak favorites went down but the leaderboard practically stayed the same. Bigsam1122 is still only one win away from the million.